Obligatory disclaimer: I received a complimentary review copy of A Perfect Score to read for this post. Image courtesy of Center Street. Released in September by Center Street, A Perfect Score ($26; 207 pgs.) 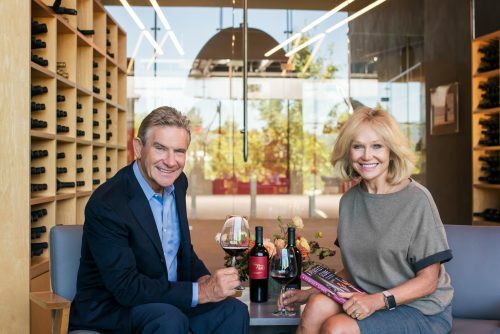 tells the story of the founding and growth of the HALL and WALT wineries from the intertwined perspectives of its two founders, Craig and Kathryn Hall. The Halls, courtesy of Center Street. 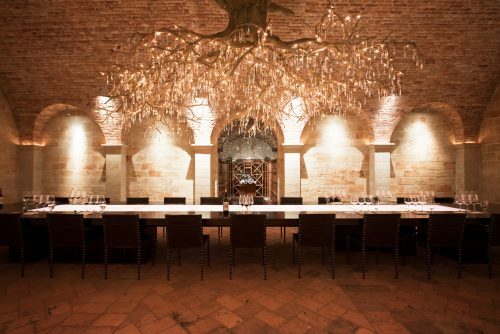 Their wines have earned two highly sought 100-point ratings from Robert Parker, the preeminent Wine Spectator critic, in only twenty years of winery existence. 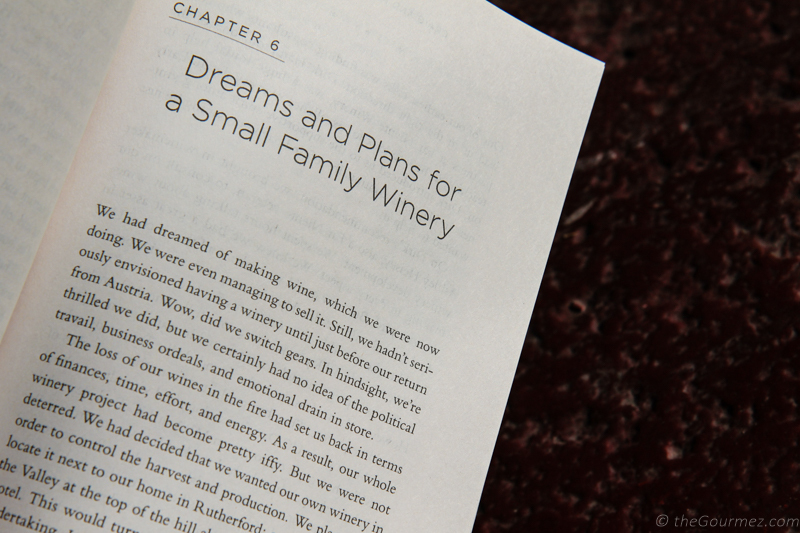 The book is a very personal account of how the Halls came to realize that owning a Napa winery (or two) was in their future, despite Craig’s lack of wine knowledge and their relationship’s origins in Texas, a long way from Kathryn’s childhood on a Mendocino County vineyard. Yet grapes are in the blood, as Kathryn’s narrative quickly makes clear. Even realizing a lifelong dream of serving as the U.S. Ambassador to Austria, which is also covered in the book’s timeline, couldn’t dissuade the Halls from their vineyard dreams once they’d set in. 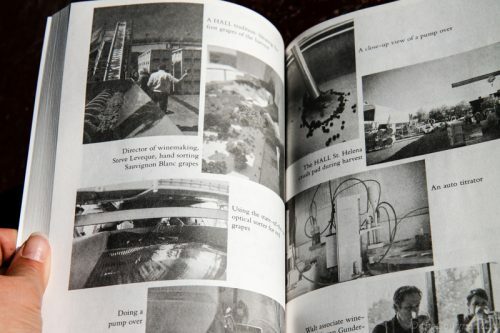 The book is full of the typical ups and downs of a business with enough effective drama to make what could be drab material into high stakes encounters. My biggest critique is that it’s never entirely clear just how high the stakes of their initial investment and glamorous plans for winery expansions were. For example, most business owners I know don’t jump immediately to hiring Frank Gehry as their architect, but for the Halls, such luxury decisions seemed foregone conclusions. And while there are details about tightening their belts to get through the Great Recession, with a lot of smart strategy outlined, I’m still not sure how much money they put into their empire or at what point a profit was made. The Halls have impeccable business acumen, but I can’t imagine that purchasing a Donald Lipski-designed chandelier made of Swarovski crystal for a then-unprofitable winery is in the reach of most people starting out in the industry. The aforementioned chandelier, courtesy of Center Street. Money well spent, after all! Thus, I think the main audience for this book is readers who are already fans of HALL and WALT wines, as it’s the particulars of those brands’ origins and their everyday maintenance that makes the book the most engaging. My second critique is in the multiple points of view offered for no apparent reason. The majority of the narrative is told from the plural first person perspective, a “we” that I assume accounts for Craig and Kathryn together. But the authors frequently get their own offset narratives to tell their individual versions of a situation or impart their philosophies on the business – I’m not sure why that’s necessary and it creates confusion going from “I” to “we” without it being clear that the “I” is still part of the “we” narration that continues. But that may be the fiction writer and editor in me talking, as that style is generally frowned upon in my industry. 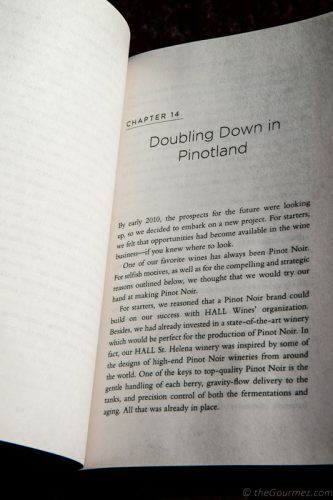 The biggest strength of the book, besides getting to know a charming couple with determination and the drive to make their business succeed, is in making many of the technical, nitty gritty aspects of winemaking accessible to those of us who don’t study it or live it on a daily basis. I finally understand the concept of rootstock versus scion, and I especially appreciated the insight into when it makes sense to pursue deeply discounted distribution deals and by-the-glass programs. Informative without making the eyes of someone not involved in the industry glaze over. Bravo! Picture pages of HALL and WALT’s history. It’s also heartwarming how highly in regard the Halls hold their staff. The book is replete with compliments and occasional wonder at how good their employees are at their jobs, from Mike Reynolds, the wineries’ president and the first employee they hired, to Director of Winemaking Steve Leveque and Assistant Winemaker Megan Gunderson to the interns known as cellar rats who spend their time doing the dirty work of keeping the facilities clean and the wines pure and full of potential. 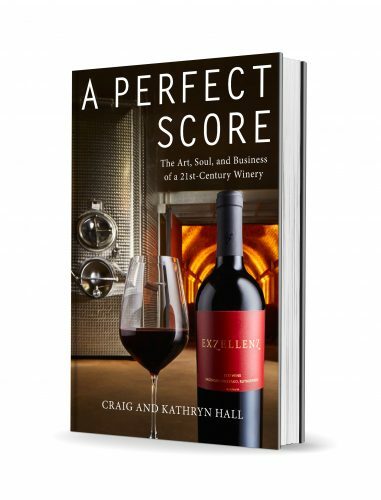 Over 50 HALL and WALT wines hold 95 point and higher scores, which is an admirable feat. For devotees of these eminent estate wines, A Perfect Score will provide a fascinating look at the origins and the philosophies behind their existence. The rest of us will get an intriguing introduction to a couple that knows how to make their dreams into reality and a budding desire to taste those dreams in the glass. I want to read more “wine” books because I always love them, but for some reason, they are never the books I pick up. It sounds like this might be an interesting way to get to know the HALL and WALT wines better.